If you're familiar with mental health bloggers, I'm sure you've already read Kel of Anxious Lass's blog - her tips and experiences are so relatable. So when I saw her eBook all over Pinterest I knew I had to give it a try. 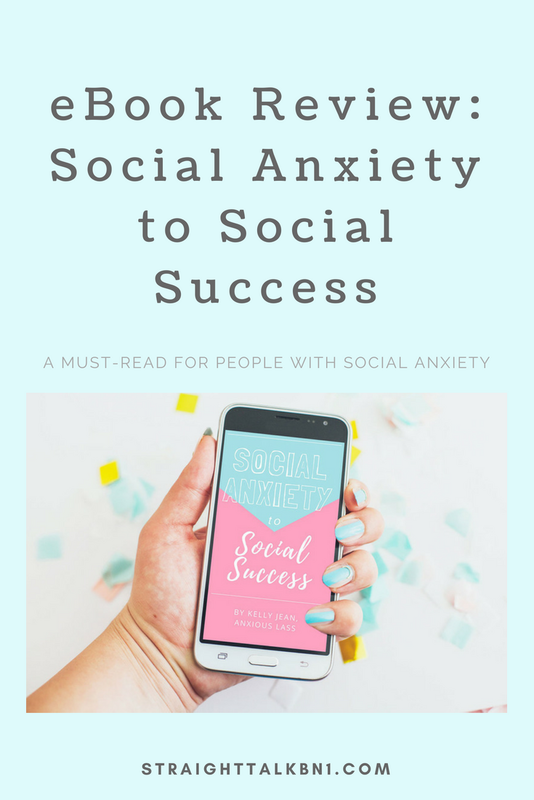 If you're unfamiliar, it's called Social Anxiety to Social Success - and I honestly I wish I'd had to this book to support me years ago! Disclosure: Some links in this blog post are affiliate links, meaning, at no extra cost to you, I may make a small commission if you choose to make a purchase through my link. Thank you for supporting the BN1 Blog. Had enough of your social anxiety? This ebook is written specifically with Social Anxiety in mind, which is something I've suffered with for years - especially while I was at university. So, when Kel starts to open up about her struggles with leaving her house, and hiding every time the door bell rang, I knew this book was written by someone who'd been through it all AND come out the other side as a happy and strong as hell human being. If you're in a bad place with your social anxiety right now, you are going to find this book super relatable. Kel hits the nail on the head when describing what anxiety feels like and all the physical symptoms that come along with it. I mean listen to this: "Have you ever heard people laughing behind you and automatically assumed they were laughing at you?" Uh oh, I don't know about you, but this question really hit home for me. Next we move on to understanding anxiety better. For years I just let my social anxiety control me, I didn't even know what it was. I knew something was wrong, and I even went to the doctor complaining of chest pain, heart palpitations and breathlessness. It was getting ridiculous, I could hardly walk up a flight of stairs without my chest tightening and feeling out of breath. But, if I'd had this book back then I would have found answers, solutions and the feeling that I wasn't alone in this. If your anxiety has a tight grip on you, this book will teach you how to not only loosen the shackles but to free yourself completely. I'm not going to lie, it'll take some work on your part and you need to be willing to help yourself. But, you can do it! Next, Kel helps you to understand where your negative thoughts are coming from, what triggers you have, any patterns that happen, and your safety behaviors. I wasn't even aware that safety behaviors are a thing until I read this book, and to this day I still have some - like avoiding answering the phone at work, or fading into the background during certain social situations. If the ebook alone wasn't enough, you'll also get some handy worksheets to help you through each section. This way, you can get everything down on paper and see what you need to change and track your progress. One of my favorite worksheets is the Anxiety Ladder - once you've figured out situations that make you anxious, you can start to beat them, one at a time. You start with the social situation that feels easiest, and then climb up the ladder to the next, and then the next. Then, before you know it, you are comfortable in situations that would have given you full blown panic attacks only a matter of months earlier. Have you read Social Anxiety to Social Success? I'd love to know how it helped you through your social anxiety - please leave a comment!